On the 28th (Tue), admire the sheer force of Chamarel Waterfall, see the interesting displays at Curious Corner of Chamarel, take in the dramatic natural features at Seven Colored Earths, then tour the pleasant surroundings at Ebony Forest Reserve, and finally explore the striking landscape of La Vallee des Couleurs. To see ratings, photos, traveler tips, and more tourist information, refer to the Chamarel journey planner . If you are flying in from Australia, the closest major airport is Sir Seewoosagur Ramgoolam International Airport. In May in Chamarel, expect temperatures between 32°C during the day and 24°C at night. 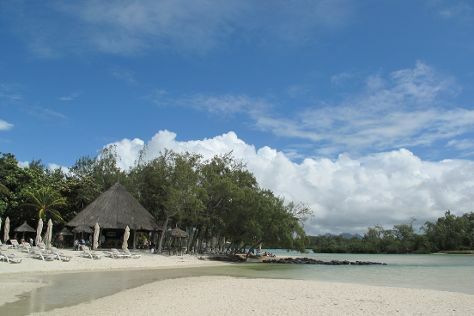 Wrap up your sightseeing on the 28th (Tue) to allow time to drive to Port Louis. A multicultural melting pot of a city, the Mauritian capital of Port Louis--or simply "Louis," as it's affectionately known--represents the most populous area of Mauritius. Start off your visit on the 29th (Wed): examine the collection at Chateau De Labourdonnais, head off the coast to Ile aux Cerfs, and then take some stellar pictures from Siva Soopramaniar Kovile Bel-Air Riviere Seche. Here are some ideas for day two: take in nature's colorful creations at SSR Botanic Garden, then examine the collection at L'Aventure du Sucre, and then explore and take pictures at Trou aux Cerfs. For traveler tips, more things to do, where to stay, and tourist information, read our Port Louis trip itinerary builder app . You can drive from Chamarel to Port Louis in an hour. Another option is to do a combination of car and bus. In May, daily temperatures in Port Louis can reach 32°C, while at night they dip to 24°C. Wrap up your sightseeing by early afternoon on the 31st (Fri) to allow time for the car ride back home.